Hackney Central station. Photograph: Smiley Tourist. 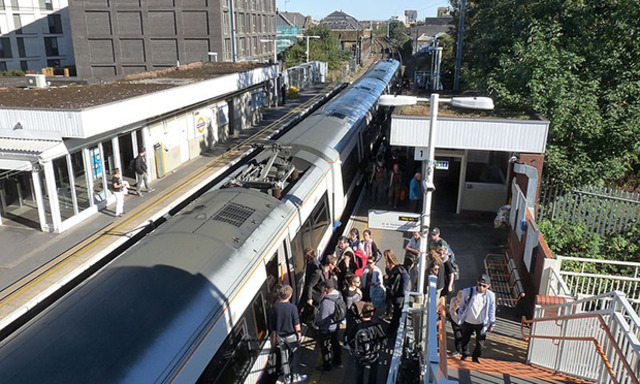 Plans which could leave Hackney’s Overground stations without a single ticket office have attracted withering criticism. Arriva Rail, which operates the franchise for London Overground, say that if rolled out the proposals, which cover 88 ticket offices in Overground stations across London, would be “safely validated,” and make assurances that trained staff will remain available to help those who need assistance. However, the plans have been met with overwhelming opposition from forum for disabled people in Hackney Disability Back-up, Hackney Council, and the National Union of Rail, Maritime and Transport Workers (RMT), who have slammed the plans as potentially unsafe. John Thornton, chair of Hackney forum Disability BackUp (DBU), said: “These cuts in London Overground ticket office staff will have a profound impact on the safety and accessibility of the stations for both disabled and non-disabled passengers in Hackney. “When TfL made the decision to cut ticket office staff in their underground stations, many disabled people were unable to call for assistance, finding themselves stranded and in hazardous situations. In response to claims that much of the work done by people in transport infrastructure can be done by modern technology, Thornton went on to question the impact of changes on passengers with learning difficulties or those unfamiliar with computer technology. Hackney DBU has stated that many of its members find it difficult or impossible to use ticket machines due to their inaccessibility, and that staffed ticket offices provide reassurance to customers at a time of heightened anxiety over the increased risk of terrorist attacks in the capital. The RMT is also up in arms over the plans, stating that the union would be fighting the closures “with every tool at its disposal”. The union cites “dire consequences” for safety, services and accessibility in its opposition to the proposals, claiming that at present there are are 363 full-time equivalent vacancies across the network, with the shortfall being managed through the use of agency staff and overtime. Hackney Council, having already expressed its opposition the closure of every one of the borough’s Overground ticket offices through a London Travel Watch consultation, are also now speaking out through a direct letter to Arriva Rail. The letter, from Hackney Mayor Philip Glanville, stands with union-raised concerns over a potential loss of important information, assistance and refuge points that the closures could bring. Mayor Glanville said: “In an inner-London borough that is already facing significant cuts to our TfL bus services, as well as few Underground stations to begin with, we consider these proposals unacceptable. “I hope that [Arriva] are able to respond to these issues directly, with further detailed information about your proposals, as well as outlines of how you intend to mitigate them. Among the 51 stations being looked at under the plans are Clapton, Dalston Junction, Dalston Kingsland, Hackney Central, Hackney Downs, Hackney Wick, Haggerston, Homerton, Hoxton, Shoreditch High Street, Stamford Hill, Stoke Newington and Rectory Road. The stations affected are: Dalston Kingsland, Dalston Junction, Haggerston, Hoxton, Shoreditch High Street, Homerton, Hackney Wick, Clapton, Rectory Road, Stamford Hill and Stoke Newington. Cllr Feryal Demirci (Lab, Hoxton East & Shoreditch), Deputy Mayor and cabinet member for health, social care, transport and parks, added: Our borough is in a transport crisis with so many broad brush cuts and a lack of detail and evidence to sanction them. “The closure plans seem more related to profit than customer service for a system which is suffering service gaps, delays and cancellations almost daily. “The proposals seem full of assumptions and little detail, including the staffing of Overground stations at peak and off-peak periods and how they will manage the risk and safety of passengers following this withdrawal. Will Rogers, Arriva Rail London’s managing director, said: “The way our customers are choosing to travel on the London Overground is changing, and at the heart of our proposals is a commitment to meeting their needs both today and for the future, be it through embracing new technology or new ways of paying. “Our proposals focus on employees being more visible and accessible in public areas of stations where research shows the majority of customers need and want them most. “We already operate this model at 16 of our stations successfully and safely, and want to extend it to more of our stations where it will work well. “We are committed to any changes being safety validated, all stations remaining staffed while trains are running and trained staff being available to help passengers who require assistance.